The Carpatho-Rusyns of Pennsylvania: History Mystery: The McKeesport "Serbian/Russian Church"
History Mystery: The McKeesport "Serbian/Russian Church"
A History of Holy Trinity Russian Orthodox Cathedral of Chicago, 1892–1992. 1992. The onetime booming steel city of McKeesport and the surrounding area were one of the earliest and largest Carpatho-Rusyn immigrant settlements in western Pennsylvania. 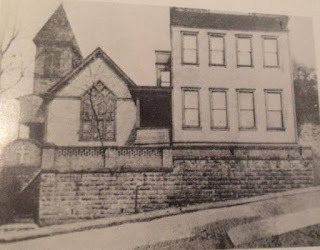 Neighboring Duquesne was the site of the founding of the first Rusyn church in western Pa. -- St. Nicholas Greek Catholic Church, which was chartered as "Greek Catholic Church of McKeesport-Duquesne." There would not be an Orthodox church established by Rusyns in either city until 1916, when St. Mary's Russian Orthodox Greek Catholic Church was organized in McKeesport and St. Nicholas G.C. Church in Duquesne joined the Orthodox Church. However, it is clear that some local Rusyns had already converted to Orthodoxy years before. 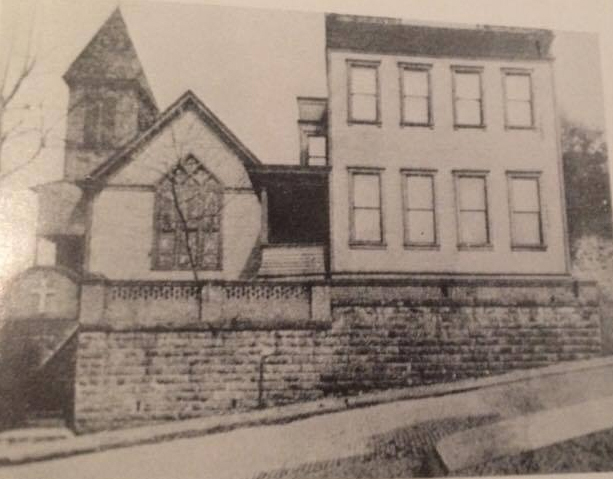 A document from 1900 about the formation of St. Michael's Russian Orthodox Cathedral in Pittsburgh (on Reed St. in the Hill District) describes the committee formed to build it. The committee members included "President of the Galician St. Nicholas Brotherhood of McKeesport, Nykolaj Dzjama." That "Galician St. Nicholas Brotherhood" was a lodge of the Russian Orthodox Catholic Mutual Aid Society (ROCMAS), which was active at the time as per mentions in the ROCMAS Svit newspaper; in 1899 the newspaper listed "Nikolaj Dzama" as that lodge's secretary. Dzjama was from Čorne/Czarne, Gorlice County; his wife Anastasija Pidana [Pidanŷj] was born in Komloša/Chmel'ova, Šaryš County. They were in McKeesport already in 1898; Nykolaj served as witness for the naturalization of several fellow Rusyn immigrants. At this point not having ROCMAS lodge/officer listings covering 1901-1905, we can't say how long he maintained his role in the ROCMAS St. Nicholas Brotherhood. But in 1904 he was the delegate from one of McKeesport's lodges of the Ruskij Narodnŷj Sojuz/Rusyn National Association (later the UNA) to the RNS annual convention in Shamokin, Pa. Nykolaj and Anastasija had a child baptized in 1907 at St. John's Greek (today Ukrainian) Catholic Church in McKeesport that was organized in 1902, a Galician/Lemko Rusyn offshoot of St. Nicholas Greek Catholic Church in McKeesport that was organized in 1901. But then his home was the meeting place of a group that in 1916 would organize a new Orthodox parish. In 1917 "Nikolay Dzama" was a signer of the charter of St. Mary's Russian Orthodox Greek Catholic Church of McKeesport, and was Vice President of the original church board. "The first Serbian settlers in McKeesport attended the Russian Orthodox Church in Woods Run, near Pittsburgh. At that time, the pastor of that church was Fr. John Nedjelnicki. Occasionally, he would come to celebrate the Holy Liturgy for the Orthodox Serbs and Russians. "...At that time , a Russian Orthodox priest lived in Pittsburgh. His name was Fr. Vladimir Kalnev. His wife was Serbian... The Serbs of McKeesport, the Russians of McKeesport and Duquesne, and this priest got together. They took under consideration the entire problem, and decided to buy a church building which could be transformed into an Orthodox church. It was a mutual understanding that Fr. Vladimir Kalnev would be its pastor... Contributions were solicited from among both the Serbs and the Russians." 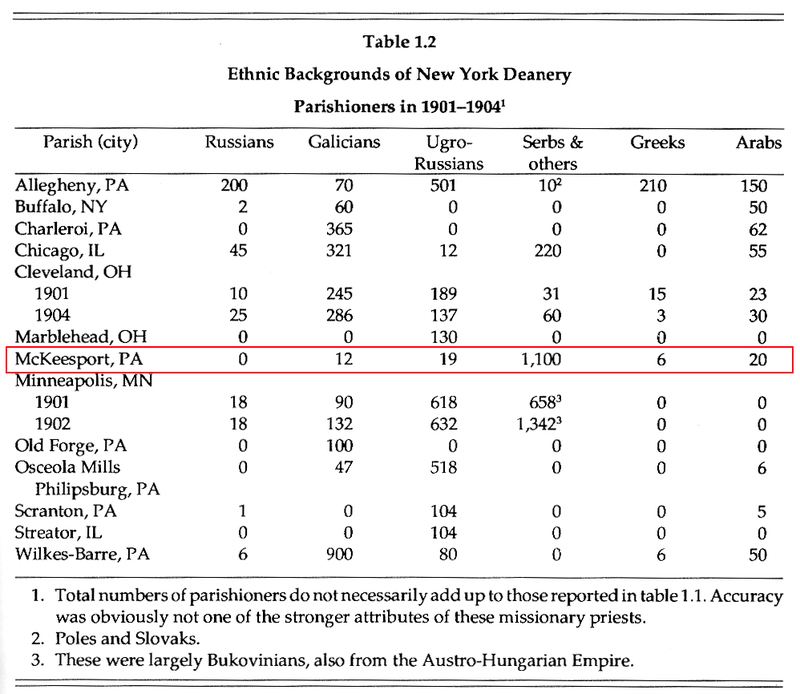 Of course, we see by the table reproduced above that there were no actual Russians in the congregation -- only "Galicians" and "Ugro-Russians" (i.e., Rusyns from Galicia and Hungary). This account continues, "As soon as the church building became the property of the Serbs and Russians, the parishioners formally elected Fr. Vladimir Kalnev as their parish priest... In May, the Russian Bishop Tikhon came to dedicate the church and a large bell which was raised and set in the belfry. However, there soon arose a disagreement between the Serbs and Russians concerning the Saint to whom the church should be dedicated. The Serbs wanted St. Sava to be the patron saint of their church, and the Russians wanted St. Nicholas, the protector of Russia. The matter was finally taken to court, where it was decided that the majority rules. Since the Serbs constituted the majority of the parish, the church was formally dedicated to St. Sava. The Russians withdrew from the church, and it became Serbian. Only a few Russian families continued to belong to the church of St. Sava to their death." Perhaps a record of that court case would name some of the "Russians" involved... I would love to see the record, if it exists. 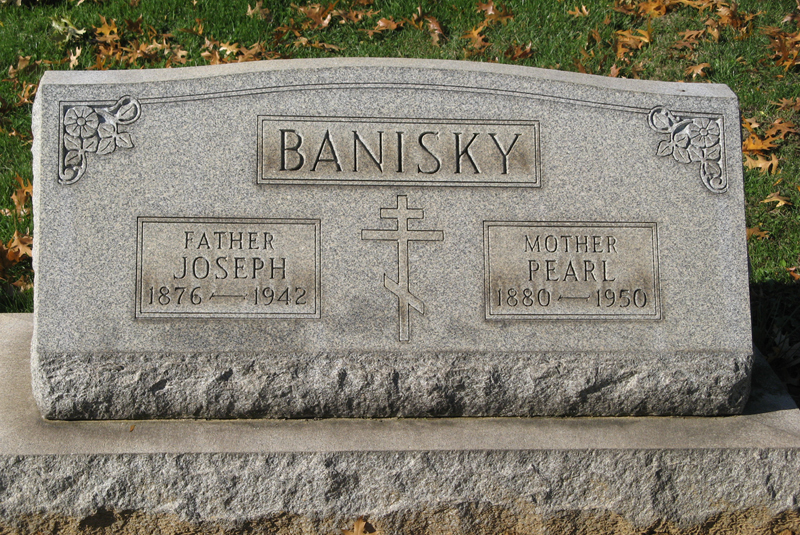 "One of the most interesting stories of church events comes from the Banisky family whose father, Joseph became the first president of the church. Joseph was born in Transylvania, Romania in 1876 of Czech parents. He met his wife Paraskevia in Czechoslovakia and they were married there. He and his wife raised five children: Anastasia, Samuel, Mary, Pearle and Ann. 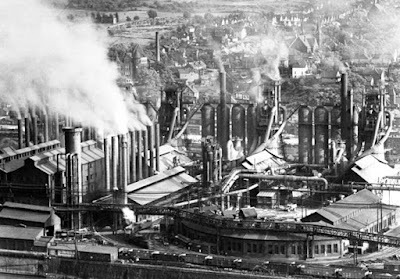 At the turn of the century, Joseph and his brother, Andrew came to McKeesport to work in the steel mills. Having been raised Orthodox, the Banisky family attended the Serbian Church, the only Orthodox church in McKeesport at the time..."
Through the courtesy of noted Carpatho-Rusyn genealogy specialist, Thomas Peters, the birth of Joseph Banisky in Transylvania (loosely speaking) was confirmed: specifically, he was born in the mining town of Anina, Caraş-Severin County, Romania, part of the historic Banat. The birth and baptism (by a local Roman Catholic priest) is recorded in the baptismal register in Becheriv/Becherov, Šaryš County, in present-day northeastern Slovakia. According to Mr. Peters, other Carpatho-Rusyn families had migrated to the same town, most likely in search of improved living conditions. That Joseph Banisky was truly "raised Orthodox" there is also possible, as both Greek Catholicism and Orthodoxy, both of Romanian ethnic character, existed in Transylvania at that time, even if Anina itself had neither type of church. 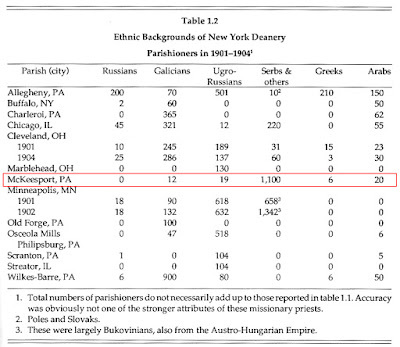 Clearly, however, the Baniskys were not "Czech," but Carpatho-Rusyn. McKeesport & Versailles Cemetery, Versailles, Pa.
Joseph was a member of Russian Brotherhood Organization Lodge #135 of Elizabeth, Pa., and when he joined he declared his birthplace to be Becheriv. (Joseph's wife Paraska, née Fedorko, was born in Becheriv.) 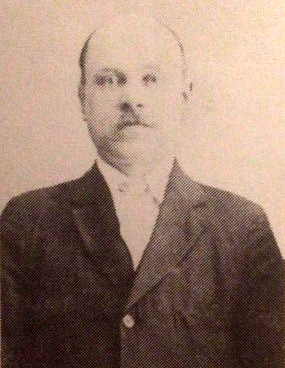 Joseph arrived in McKeesport a second time from Becheriv in 1907, and Paraska would immigrate to McKeesport along with their first child in 1909. A "return to Orthodoxy" movement began in Becheriv in 1901 and we would expect that these families were involved in some respect, given their early association with the Orthodox Church in McKeesport. The metrical records of St. Sava Church may well bear witness to many sacraments administered to these Carpatho-Rusyn members. And the metrical records of St. Mary's - Holy Virgin Dormition Russian Orthodox Church will surely help to tell this story more accurately. I am hoping to be granted access to them to see for myself when I visit the Pittsburgh area on a research trip late this month.